So Sybil from Animated Confessions and Bestie from The Capricious Club have this awesome feature called "My Way, Her Way, Their Way" where they take a trend and show four different takes on it through their own personal styles and the styles of two other bloggers. This time they invited the Dynamic Duo (me and Jasmine) to participate in this feature using the trend peterpan collars! Luckily I had just ordered this dress in the mail a few days before receiving the email so I was beyond excited. (and yes, I know I look like I'm sort of doing a jig in the picture above). 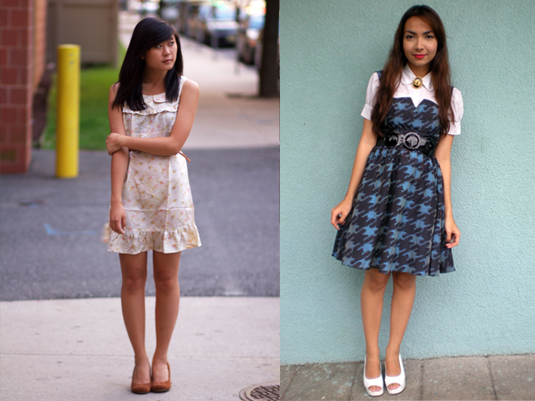 Bestie paired this houndstooth dress with a peter pan collared blouse and a gorgeous brooch. I love how classy she looks with all these pieces effortlessly pulled together! My favorite part is definitely the addition of the brooch. Definitely check out her site for a close-up picture! Now I've gotta go get ready for class. I'm having the most unhealthy brunch consisting of spicy buffalo wings, fries, mashed potatoes, and chicken nuggets. Yay leftovers! I promise I'll be healthier when it comes to dinner (maybe). Love Peter Pan collars. So sweet. awww YOU are the cutest Jen! I love the collar and print of this dress. And oh my!! Thank you oh so much for watching my vlog! I would be so happy if you did one. They are super awkward to make (I'm sure my roommate thinks I'm crazy. And I pointed out how awkward it was in the first three seconds), but so worth it! College is lots of fun :) I'm so happy! Suuuch an amazing dress!!! I luv it!! so cute! P.S. You look gorgeous on the first pic. You look too pretty. gorgeous. Wow, such beautiful looks. That detachable collar is a great idea! all the pale colors are so pretty for fall. this is classic, understated and gorgeous. You look gorgeous, Jen! The dress is so pretty on you and I love seeing you in florals! I had nightmares all last night because I was getting anxious about NYFW. Do you have ANY idea which out of the 241912314 choices for FNO should we attend? My friends are all telling me different things, and I'm so confused! Ohmygoodness. That dress is beyond adorable. I absolutely adore peter pan colars. I think that Jasmine's outfit is absolutely perfect and wonderfully put together. 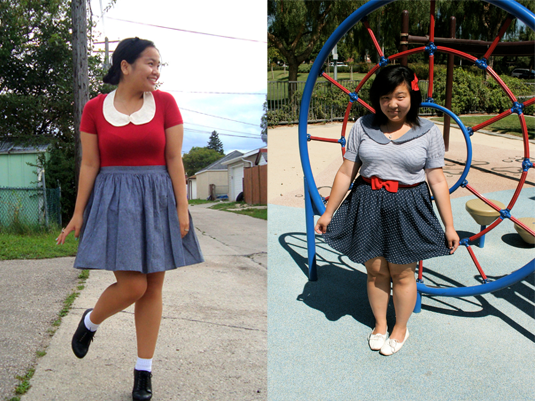 I love the bows and the stripes and polkadots together. You look grown and chic. So often, Peter Pan collars can look childish and girlish, whereas you look amazingly mature and sophisticated. What a lovely dress, and I just adore peter pan collars, especially on you four! You all look amazing! yay!!! :D gotta love this of course! Anyway, if there is certainly any info you will need on Gap, or any other significant clothes retailer from the US, please let us know. Let us know if you have any excellent ideas for new blog posts! I'd love to know where you got this fab dress you are wearing!? Thanks for making such an awesome blog!